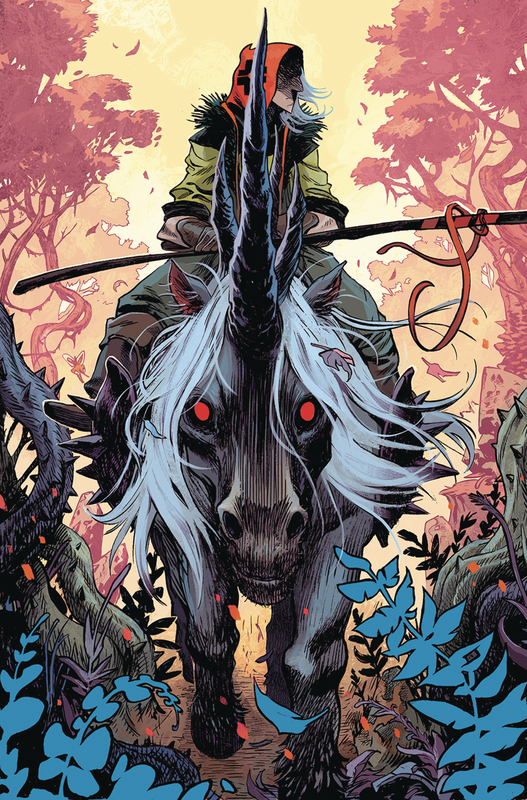 Simon Spurrier ( The Spire, Godshaper ) and Matias Bergara ( Cannibal, Supergirl ) present a broken fantasy world that?fs perfect for fans of Mad Max and The Lord of the Rings. In the aftermath of an apocalypse which wiped out nearly all magic from a once-wondrous fantasy world, a former bard named Hum (a man of few words, so nicknamed because his standard reply is ?ghm?h) seeks a way to save the soul of his wife with nothing but a foul-tempered mutant unicorn and his wits to protect him...but is unwillingly drawn into a brutal power struggle which will decide forever who rules the Weird Wasteland. Oversized first issue, with 40 pages of story content and additional backmatter at no extra cost!